Toy soldiers and worry dolls, runes and chess sets, amulets, talismans, good luck charms and voudou dolls; obsolete objects transformed into harbingers of fate. Trinkets, momentos and keepsakes: pieces of loved ones to carry during long absences. The art of the miniature inspires nostalgia as much for childhood as it does for the Long Lost Age of Romance. When the only way to fall in love was through chance meetings followed up by the writing of poems attempting to intellectualise nature. 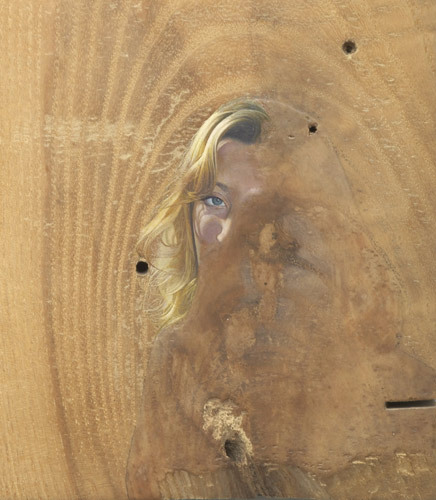 If unrequited love is a childish sentiment – belonging to that same part of the imagination that delights in finding faces in the knots and scars of tree trunks where branches have snapped off – then Lee Edwards' work can be said to herald the next phase, where we take the chaotic emotion of childhood and shape it into something tangible. A tactile set of satisfyingly thick sections of tree branches, knobbly like extracted vertebrae and a pair of nicely shiny conkers are the canvas, imitating reality with their boundaries and limitations. Onto these once discarded objects, Edwards projects his wonts and losses. The faces of past obsessions, lost loves and departed sweethearts, frozen in time. Miniature portraits were originally designed as a gift for dignitaries and the Royal Court's immediate circle; paintings of wives, Christ and Princes offered up as status symbols. It was during the Elizabethan era that the idea of the hidden painting in the locket of an admirer came into fruition, often referred to as a 'jewel'. Echoing the sensibilities of miniature painting popularised during the Renaissance by Hans Holbein, Francois Clouet and Nicholas Hilliard, Edwards' work also harks back to a more recent past. His paintings are infused with a haunting melancholia for opportunities lost. There is no concealment of secret admiration, but it is in their creation that love's demons are extorted. Edwards marks every detail. Tight little expressions set hard against the grain, and in doing so begins a quiet exorcism of the past. The objects bristle with intent. It is almost impossible to resist picking one up and turning it over in your palm, then begin twinning one with another, then rearranging the whole set to stand in groups of threes. And as you add meaning to each, you begin to add a little life, add a little personality, find a little soul. This show is made for the girls who just weren't meant for us. Lee Edwards lives and works in London. Edwards graduated from the Royal College of Art (MA Painting) in 2005. This will be his first solo show in the gallery having exhibited in 'Time is a Sausage (A Show of Shows)' in 2009. His first solo show 'No One In The World' was at Gimpel Fils, London in 2008. The gallery is publishing a limited edition chapbook for this exhibition that includes Edwards' complete series of miniature portraits. Iphgenia Baal is a writer, living and working in Bethnal Green. Her first novel 'The Hardy Tree: A Story About Gang Mentality' will be published by Trolley Books on Wednesday 15 June 2011.